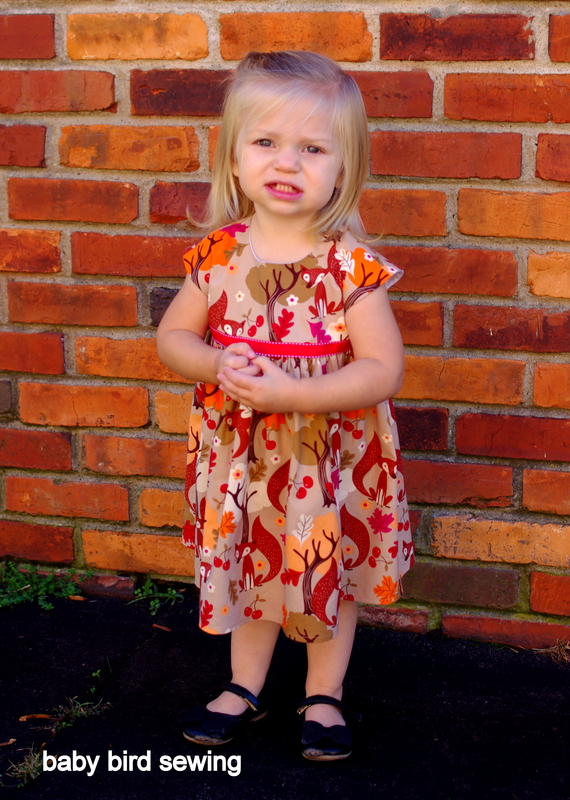 There is no better basic dress pattern than the Geranium dress pattern from Made by Rae. 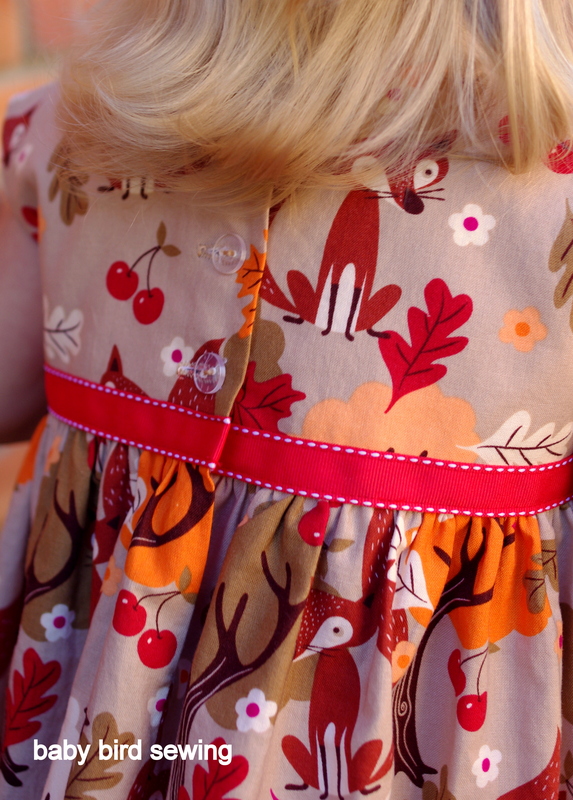 I have made so many variations of this dress that I’ve lost count–definitely more than ten! 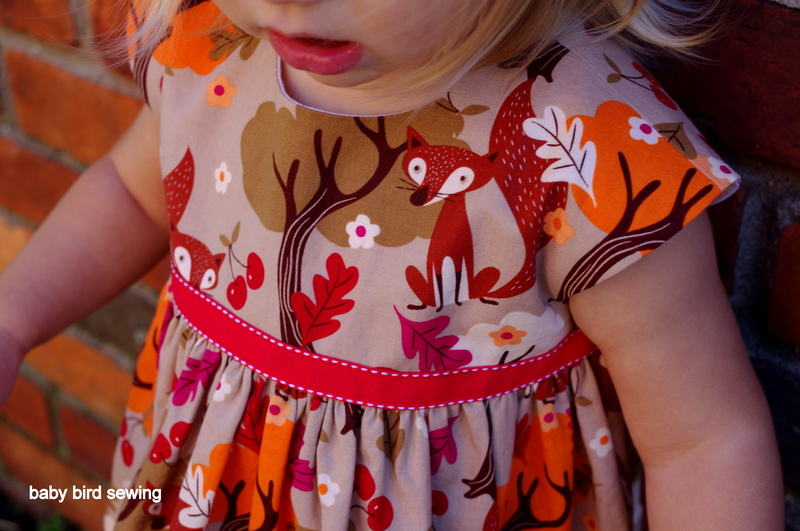 And anytime I need to make a dress and I don’t have the right pattern (like this year’s Halloween princess dresses, which you can read about here and here), I just modify the Geranium dress to get what I want. It fits perfectly EVERY SINGLE TIME! My girls have different body types and it still fits them both perfectly. This Geranium dress was a little bit unplanned. Usually I like to pick a pattern first and then find a fabric that suits the pattern. It was the opposite this time around. I had this fabric from Joann’s that I thought was adorable and just didn’t know what to make with it. I realized that fall is quickly passing us by and so I wanted to make something cute, quick, and easy. The Geranium dress with cap sleeves fit the bill. I added the red ribbon to break up the mostly neutral tones and to give the dress an added pop. Since I didn’t really have any buttons that matched, I just went with clear buttons. Not the best buttons for the dress, but certainly acceptable. Besides, the ribbon is what I wanted as the main embellishment anyway. I was a little worried about the large print, thinking it might be overwhelming on such a little dress, but it looks great. And it is especially precious on my sweet Katie, who by the way is getting three teeth right now. Yikes! The ribbon does complete the dress! I love that!